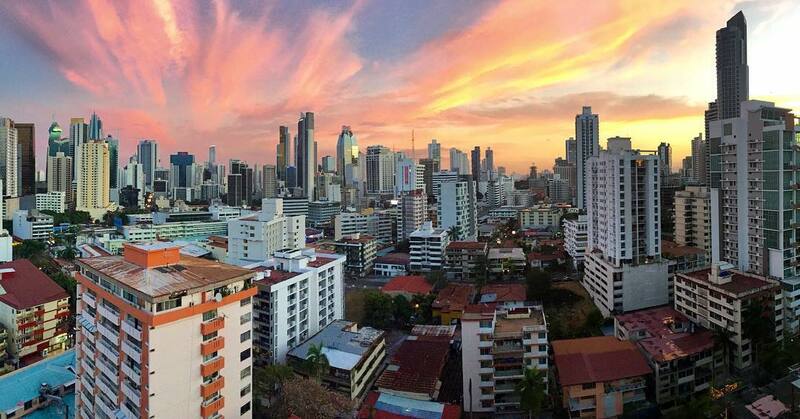 When choosing a hotel in Panama City before your trip, it can be difficult to pinpoint exactly what neighborhood to stay in. Do you want somewhere in the middle of the action or somewhere a bit quieter? Or is having a new modern hotel more important to you than old world charm? Every type of option is available in Panama City, and it just depends on what kind of accommodation you are looking for, as well as your budget. The majority of tourists choose to stay in either the historic district of Casco Viejo or in the glitzy highrise hotels in the city center. It’s all considered Panama City, but people typically refer to the historic district as Casco and the high rise area as El Centro or downtown. A misconception of the two sectors is that they are far from each other when in reality it takes only 10 minutes and a $3 Uber ride (use promo code UBERPTYLIFE for a free ride) to get from one to the other without traffic. So even if you have “hotel remorse” after booking you won’t be far from either neighborhood. Here is a breakdown of staying in Downtown Panama City VS Casco Viejo. As you drive into Panama City from the airport, a bustling city of towers almost comes out of nowhere. Maybe you’ve seen photos of Panama City online before your trip, but it never compares to the concrete jungle you are about to enter. It looks rich, powerful, and booming on the outside, but nestled in between the posh neighborhoods of Punta Pacifica and San Francisco is the slum of Boca La Caja, which the government has tried to hide from view of the highway with greenery. The city has life to it. It’s a place where people are living, working, and going about their daily lives so staying here you will be amoung locals & expats living in Panama. There are lots of great cafes & restaurants you can walk or Uber to, and plenty of good bars & breweries when you need a drink. The center of the city can be a great option to stay in as a tourist, especially for the price. Due to an overbuilding of hotels in the city, it’s a bargain to be here. For example, the Best Western Panama Zen Hotel and the TRYP Hotel both have rooftop pools and start around $60/night. Both hotels have plenty of restaurants within walking distance plus are next to a metro stop for easy and cheap (.35 cents) access to other parts of the city. Or let’s say you want to stay somewhere luxurious for the price. The Sortis Hotel has rooms starting at $125/night in the city center, or you could stay at the Hilton on Avenida Balboa for $140/night and be steps away from the waterfront. Try finding a luxury hotel in Miami for those prices! While the city center offers great quality for the price, I think it can also be a bit hard to figure out. A lack of street signs and proper urban planning can make it overwhelming for tourists to find their way around. It can also be noisy and congested with traffic as the masses flock in and out of the city for work. Also, if you’re looking for nightlife & entertainment, the majority of Panama’s trendy bars & restaurants have moved to Casco Viejo. Panama City’s Casco Viejo district was founded in 1674 after Pirate Captain Henry Morgan ransacked and burned down the original location. This developed into a beautiful Spanish colonial town which was then abandoned over time as residents moved into modern Panama City. A little over ten years ago, much of this area was still in ruins and many of the parts you can now walk through today were former dangerous “red zones.” It’s especially been over the last five years that the hipsters have invaded and is now the most popular neighborhood for locals and tourists to visit. The Casco Viejo that you walk through today is safe and charming. Many of the deteriorating buildings have been restored to their former glory and are filled with cafes, street art, and new brick streets. You’ll find that it’s peaceful and quiet during the day and then comes alive at night once all of Panama City’s locals head to visit Casco’s trendy rooftop bars and epic parties. The great thing about staying here is that you also have an array of stuff to do within a 12 block radius. However, the top three reasons that I hear of people not staying in Casco Viejo is that they think it will be too touristy, it’s expensive, or they are worried about the noise. Is Casco Viejo too touristy? Not all at. Panama City is not a resort town. It’s a place where real people live and work, and they are not going to be having the beer in Casco Viejo on a Wednesday afternoon as you can. So during the day, you will probably see groups of tourists and government workers, but wait until the evening hits. 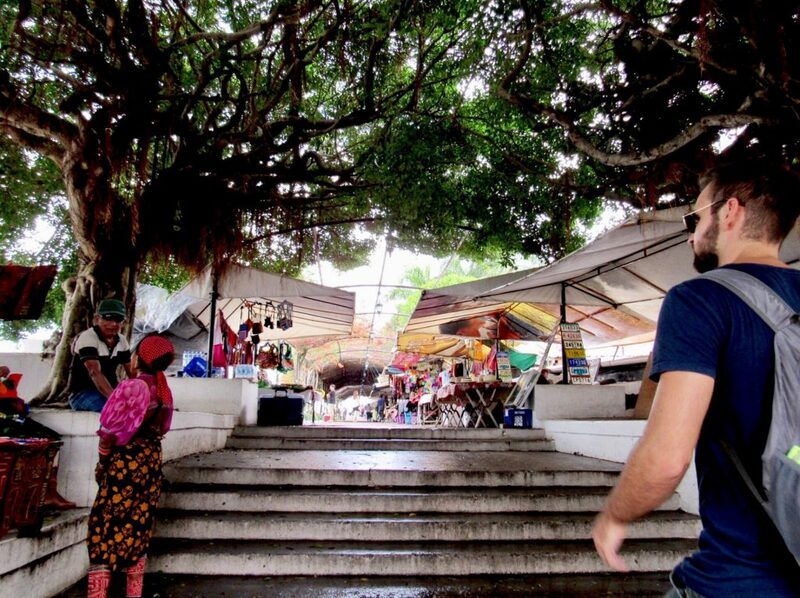 And if you want to see some local people, take a stroll to nearby Parque Santa Ana and Avenida Central. Is Casco Viejo too expensive? Yes and no. Restaurants are pricier here, and it’s common to find bars that charge $20 cover and $10 drinks, but you can make it cheap with a little preparation. If you want an excellent night out without breaking the bank, I recommend getting a Soy del Casco Night Pass. This grants you 7 free drinks and free entry into 7 bars in Casco Viejo for just $25. There are also some awesome happy hours in Casco. Rana Dorada has half-price beers from 12 pm – 6 pm on Monday to Saturday, Pedro Mandinga has $5 mojitos before 6 pm on Monday to Friday, Tantalo has half price drinks before 7 pm during the week, and the 360 Rooftop has a bucket of local beers for $6 on Tuesdays just to name a few. You can also visit Mojita, Relic, Hippies, Malibu, and El Social for decently priced drinks. If you’re looking for affordable places to eat in Casco you can get a full meal for around $5 at Cafe Coca Cola, or amazing Filipino food at El Corazon, sandwiches at Nomada Eatery, and healthy options at Mahalo. If you need a cheap place to stay then Hospedaje Casco Viejo, Luna’s Castle, Magnolia Inn, and Hotel Casco Antiguo have dorms starting around $15/night and private rooms around $30 – $80/night. Is Casco Viejo too noisy? Parts of it are definitely loud. Casco Viejo has become the epicenter of Panama City’s nightlife and those rooftop bars love to blast their music. However, don’t let this deter you from staying there! By choosing the right hotel you can avoid staying somewhere that will keep you from being able to sleep. The Villa Palma Boutique Hotel, La Isabela Suites, American Trade Hotel, and Casa Garay are secluded from the rowdy party crowd. So what is the best option? 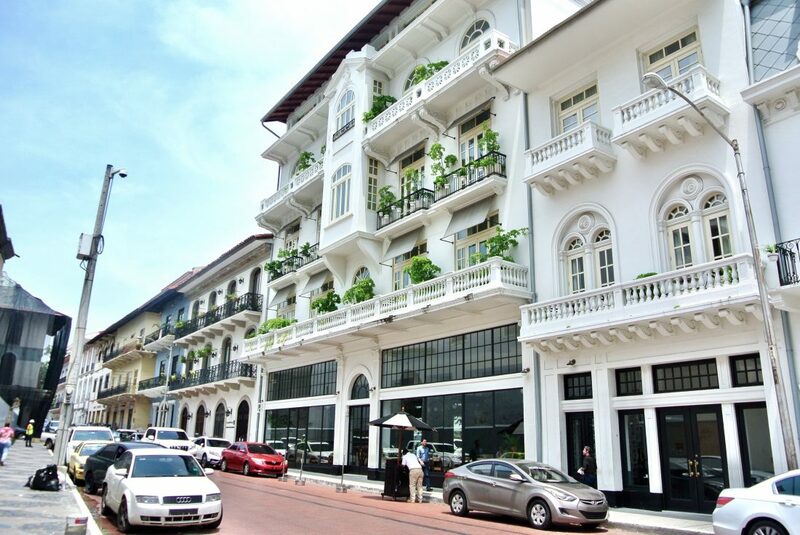 For a first time visit to Panama City, I think it’s best to stay in Casco Viejo. You’ll be steps away from things to do and the slower pace of life makes for a relaxing vacation. Or if you have the time, stay in both! You could spend a few days in the historic center and then relax at your rooftop pool in the city while deciding which is better. 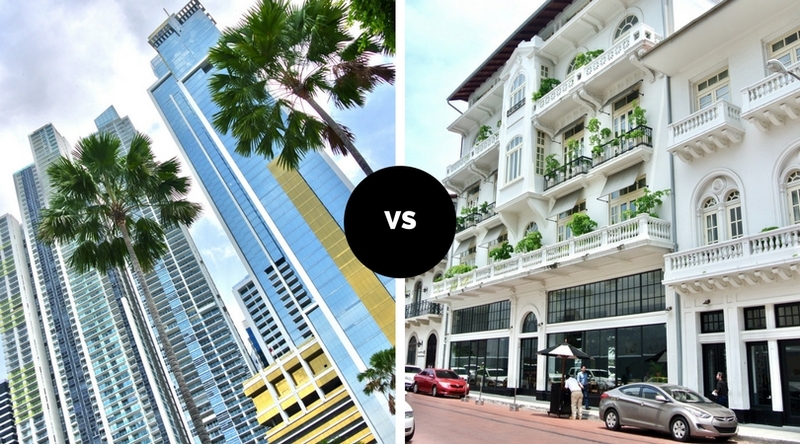 Whichever neighborhood you choose, be sure to also read my Quick Guide To Casco Viejo and Quick Guide Panama City for the top things to do. Or book a tour with me and I’ll show you around! Hi Joey, interesting recommendations!!!! Also, if someone is looking for light, fresh, healthy food and even vegan or vegetarian options, Dodó offers a wide range of choices, including breakfast available all day. At the end of 1st St, in front od the French Plaza.